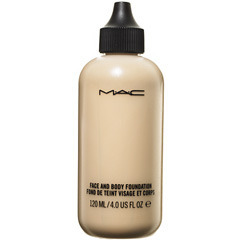 MAC Face and Body is a long-time celebrity favorite, used by the likes of Cheryl Cole and Jennifer Anniston, for its ability to even and correct, but also add the dewy glow back into your skin while remaining undetectable in harsh lights. A lot of people describe this as the lovely Lollipop26 once said, this is the foundation to fool your loved ones in. A water-based, water-resistant foundation that provides long-lasting, natural coverage for face and/or body. Ideal for all skin types. Face and Body Foundation provides sheer, natural looking coverage in an easy to blend, water-resistant formula. The long-lasting formula is available in a wide range of colours and contains several emollients to help moisturize and condition the skin. It delivers professional looking results that meet the exacting standards of beauty photography and is ideal for the face and body. If you enjoy tinted moisturisers or mixing foundation into your lotions, this would probably be a great product for you. If you have good skin, this can make you look flawless. If your skin needs a little help, it layers well enough to do just that as well. Light and natural. This can even out your skin tone somewhat, but if you have a lot of hyper-pigmentation or redness, you will need a second layer or some concealer. I bought C2 and C3 because I'm an NC25, but I think either one of those would have worked. I'd say if you are a NC or NW "15, 25, 35" or any other in-between number, round it up and get the shade that may be a little darker than you, as the shades disappear into your skin very well without muddiness, and would be undetectable in flash-photography. So if I'm NC35, I would buy a C4. Dewy. I recommend powdering the T-zone even if you love the dewy look. Even when my skin was dry, this foundation left a sheen that can look like grease, especially if you'll be taking photographs. Your skin looks like perfect with this foudation. Did you use some sort of iluminator around the lips?